Umbrian region and in particular Assisi are deeply related to the life of Saint Francis, patron of Italy, who was born here. Assisi is characterized by a special atmosphere of spirituality, in addiction to the beauty of the historical center and the Cathedral dedicated to Saint Francis. There are also other places linked to his life and not to be missed, where visitors can find again their own mind wellness and an armony with the surrounding world: one of these places is the magnificent Eremo delle Carceri (literally, Jails Hermitage). Saint Francis and his disciples came here to pray and meditate, immersed into the silence and the spirituality of the nature. 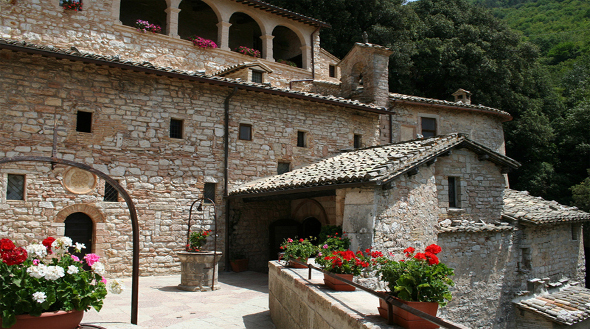 The Eremo delle Carceri (Jails Hermitage) is located at 4 kilometers from the center of Assisi, at 791 meters of height above sea level on the slopes of Subasio Mount. 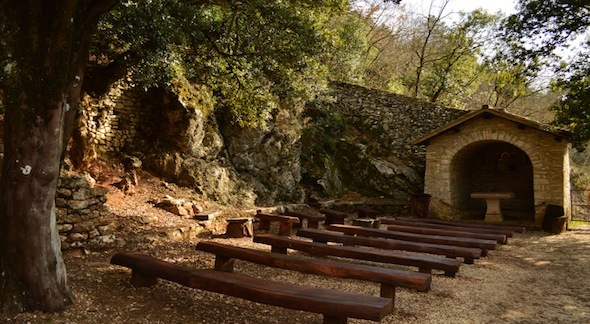 It is near to some natural caves frequented by hermits in the early Christian age, in a beautiful oak trees forest where many pilgrims still come to retire theirselves in contemplation. 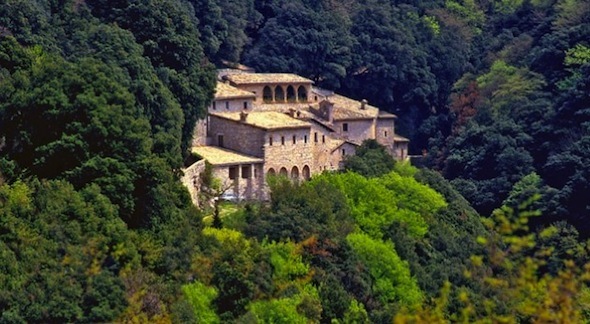 Originally, the administration of Assisi gave the site to the Monks of Saint Benedict; then, they gave it to Saint Francis to let him of coming here and meditate. The so called "jail" hermitage comes from the italian "se carcerare", in English "put yourself in jail"meaning isolate yourself and, thanks to this form of segregation, find God in the silence and the pray. In 1400, because of the works of Saint Bernardine of Siena, the ancient and primitive pre-existing chapel and a small convent were included in the Church of Saint Marie of Jail. To reach the Eremo delle Carceri (Jail Hermitage) coming from Assisi, you have to take the road that goes up the Subasio Mount, continuing for up to a cobblestone masonry. Above it, you will find the Chiostrino dei Frati (Cloister of the Monks), a triagular terrace overlooking the so-called "Fosso delle Carceri" (Moat of Jails). At the end of the cloister there are some doors leading to the dining hall of the friars and to the Church of Saint Marie of Jails; at the upper floor of the refectory are situated the friars' rooms, called cells. Going down along a steep flight of steps from the monastery, you will reach the cave of Saint Francis, immersed in a forest of holm oaks. 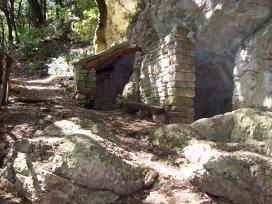 From the path in front of it, you will reach also the caves of his first disciples: Leone, Antonio from Stroncone, Bernardo of Quintavalle, Egidio, Silvestro and Andrea from Spello.